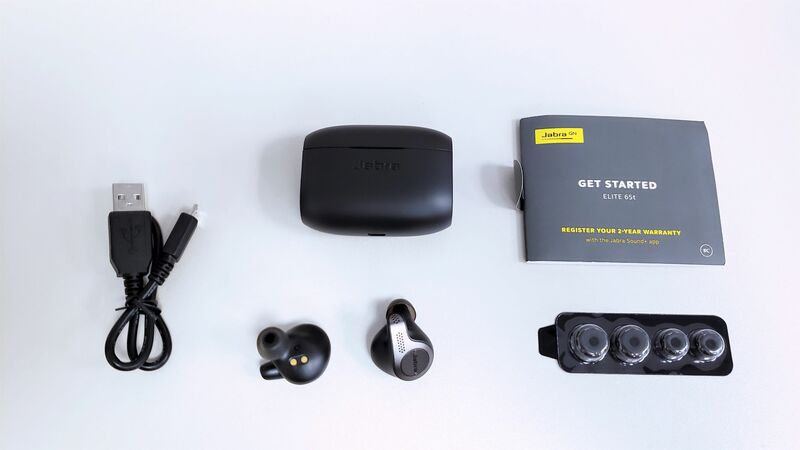 While we explored the floor at CES 2019, we bumped into Jabra’s showcase of their Elite line of products. We were teased by their latest upcoming product, the Elite 85h over ear wireless headset, which already has us intrigued. 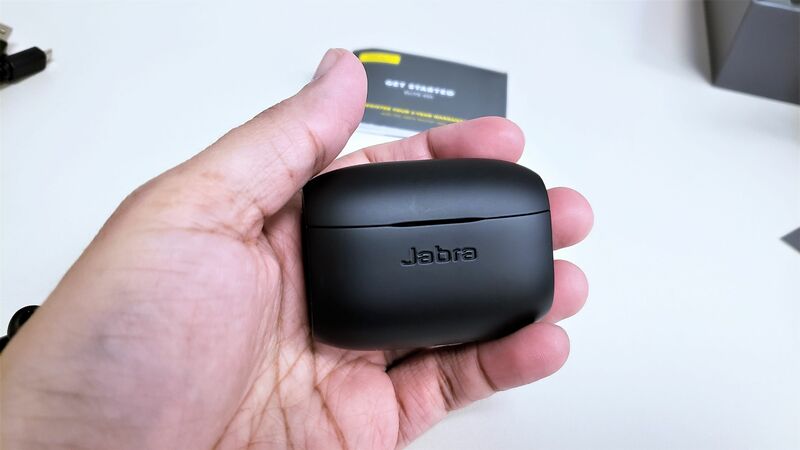 We then learned about one of their currently available products, the Jabra Elite 65t, a CES Innovation Awards 2018 Honoree. The Jabra Elite 65t is a pair of true wireless earbuds designed for music enjoyment and wireless call handling. Few truly wireless earbud products tout call quality as one of their main features. Therefore, in a market saturated with wireless earbud products, we simply had to see what set these earbuds apart from the rest. 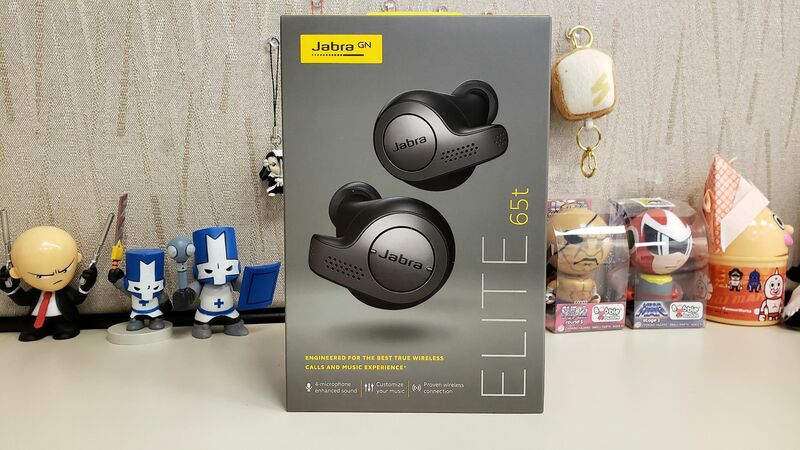 Let’s dive into the Jabra Elite 65t, true wireless earbuds available now for $169.99 at major retailers such as Amazon, Best Buy and Verizon. The Jabra Elite 65t packages everything you need to get the show on the road with these earbuds. You are provided a microUSB charging cable, a hard plastic charging case, three different sizes of ear tips, and the Jabra Elite 65t headset itself. The Jabra Elite 65t houses 6mm drivers and four microphones. This 4-microphone technology allows for a beam-forming directional field, so that the headset only allows in sound from one direction, the speaker. The Jabra Elite 65t also sports IP55-rated water and dust resistance and Bluetooth 5.0, protecting both your physical investment and your wireless sound connectivity. On the left earbud, you have a sort of rocker button that can be pressed towards either the front or the back. This controls the headset’s volume with button presses and moves through tracks with button holds. You can also tap the left earbud button when no media is playing to trigger a voice prompt that reports the headset’s battery status. The right earbud houses a single straight-press button that controls play, pause, call handing, and triggers your phone’s voice assistant. Double-pressing the right earbud button toggles the headset’s Hear Through function, allowing you to hear your environment using the Jabra Elite 65t’s four microphones. The included charging case is made of a hard plastic shell and houses a 500mA battery. While the Jabra Elite 65t sports a 5-hour lifespan of continuous use, with the charge case you get up to 15 hours of usage out of the headset. The case takes up to two hours to fully charge and has a Rapid Charge feature that can immediately give the headset 1.5 hours of life from only 15 minutes of charging in the case. As far as comfort goes, the Jabra Elite 65t is extremely lightweight while maintaining a very sturdy hold within your ears. Once you find the perfect ear tip size for you, the Jabra Elite 65t remains secure in your ears, even if you violently shook your head. Although Jabra made sport versions of this headset, I still took the Jabra Elite 65t to the gym to get a proper gage of the headset’s stability. While sweat combined with burpees did eventually make me feel as if the headset was slipping, the Jabra Elite 65t somehow held strong. 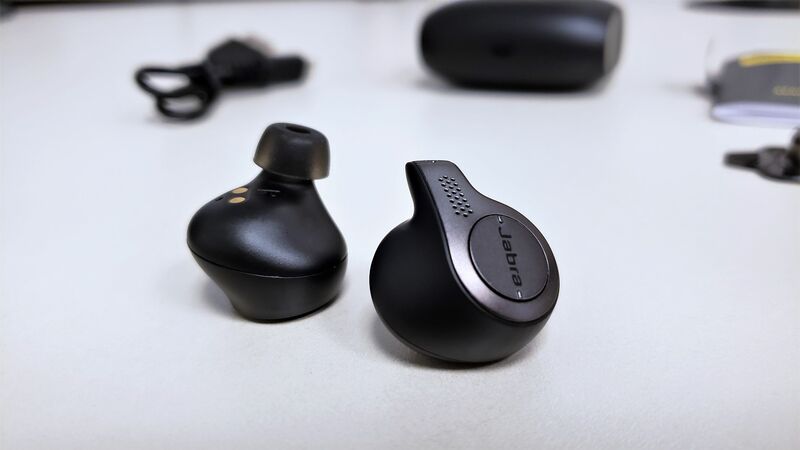 In a more stationary setting, I wore the Jabra Elite 65t for the extent of its 5-hour lifespan and found little to no wear fatigue after long-term use. When it came to handling the Jabra Elite 65t, there was a slight learning curve when managing the earbuds with a single hand. The single button on the right earbud was no problem, since there is only one way the button could be pressed. This button was also quite responsive. However, the “rocker” button on the left earbud took some getting used to. Since you can tilt this this button either forward or back, I found myself using my middle finger and thumb to hold the earbud before pressing in either direction. Simply pressing this button without using this “pinching” method felt uncomfortable, since it led to me pushing the earbud deeper into my ear. Once I mastered this “pinch” method, changing tracks and volume levels became both comfortable and second nature. The battery life of the Jabra Elite 65t was respectable. From a full charge in both the Jabra Elite 65t and its case, I was able to use the Jabra Elite 65t for about an entire workweek, on my standard music listening schedule. I do about an hour of listening during my daily commutes, combining to and from the office, and an hour during each visit to the gym. During the review, the unit handled five business days of usage with three gym trips that week. I also sprinkled in a couple of lunch walks as well. In total, the Jabra Elite 65t handled more than 10 hours of listening without even hitting its power limit. Starting off with media and music enjoyment, the Jabra Elite 65t has a pretty solid sound presentation. Without tweaking EQs, the 6mm drivers produced solid and crisp highs, where percussion (drum sounds) seemed to thrive the most. Bass was warm and present without sounding muddy and spoken word and mids came across quite clear. However, I did find myself adjusting the EQ settings to Bass Boost as I felt some of the music I was listening to leaned too deeply on the highs. Once I applied that setting, I found the sweet spot that made music listening on the Jabra Elite 65t just right. How did I adjust those EQ settings, you ask? It was done through Jabra’s free Jabra Sound+ app for iOS and Android. The Jabra Sound+ app lets you toggle EQ settings, create your own custom EQs, and manage some of the other features of your Jabra products. I found the Jabra Sound+ app to be pretty intuitive, actually. Not only was fine-tuning EQ’s easy, but you can pretty much customize any notable feature of the Jabra Elite 65t. You can even use the app to update the firmware of the Jabra Elite 65t itself. 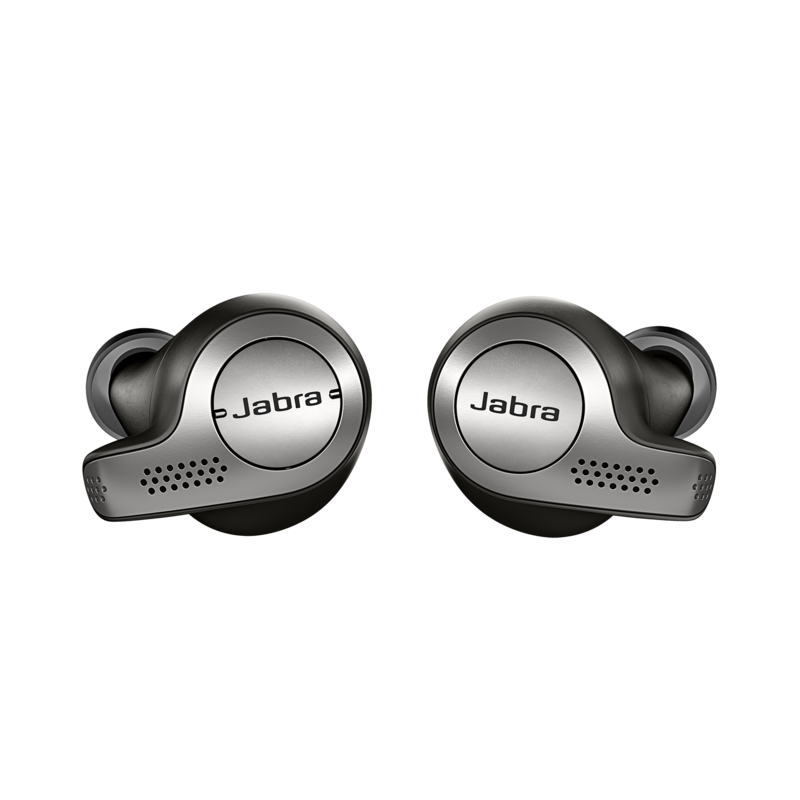 Jabra developed a very solid companion app in the Jabra Sound+. The Hear Through function was also quite intuitive, making listening to one’s surrounds easy without having to remove the earbuds. The ear tips themselves do a good job at passively isolating sound, even when there is no music or sound playing in the headset. Therefore, it was quite the luxury, being able to quickly listen to mass transit announcements or the occasional passerby without having to plop out an earbud. Even double-pressing the right earbud button was easy enough. Best of all, you are able to choose whether you want any playing media to stop or continue playing whenever you activate the feature, using the Jabra Sound+ app. If this feature isn’t your cup of tea, the Jabra Elite 65t also automatically pauses playback when you remove one of the earbuds from your ear. The biggest shock in performance came with the quality of voice calls via the Jabra Elite 65t. Whether I was in the office or walking through Times Square, call participants on the other end reported hearing me very clearly and without issue. The mic did pick up background noise when I wasn’t speaking, like the rustling of my paper bag or a car driving by. However, whenever I spoke, the background simply didn’t matter as it was left out of what was transmitted to people on the other end of calls. I wasn’t expecting this kind of call quality from ear buds, and all I could do was applaud it. I may be a little late to the Jabra Elite 65t, but it is so far the best true wireless earbud solution I’ve used so far. You have a very good sound presentation that is under your control via the companion app. You get surprisingly clear call quality from a pair of ear buds. You then top that off a solid and comfortable build quality that lasts long, resists the elements and delivers. A $169.99 price point may scare some, but the Jabra Elite 65t validates the price point with its features and performance. If you are in the market for a 100% wireless ear bud solution, the Jabra Elite 65t is, right now, my pick for you. † Jabra Elite 65t unit provided by Jabra US PR for review. Some product images taken from the Jabra media hub.